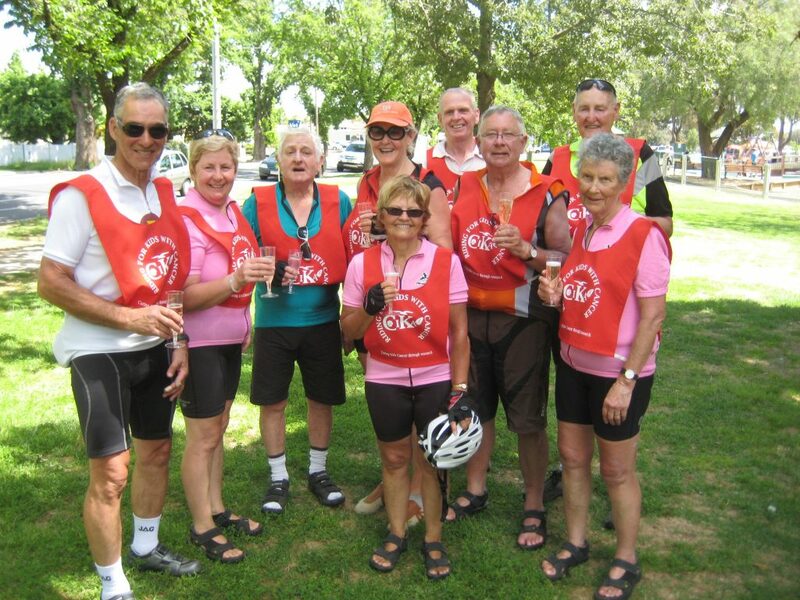 The following article was written by Barry Rayner, a member of the group that cycled from Robe in South Australia to Bendigo to raise $3259.50 for CIKA. 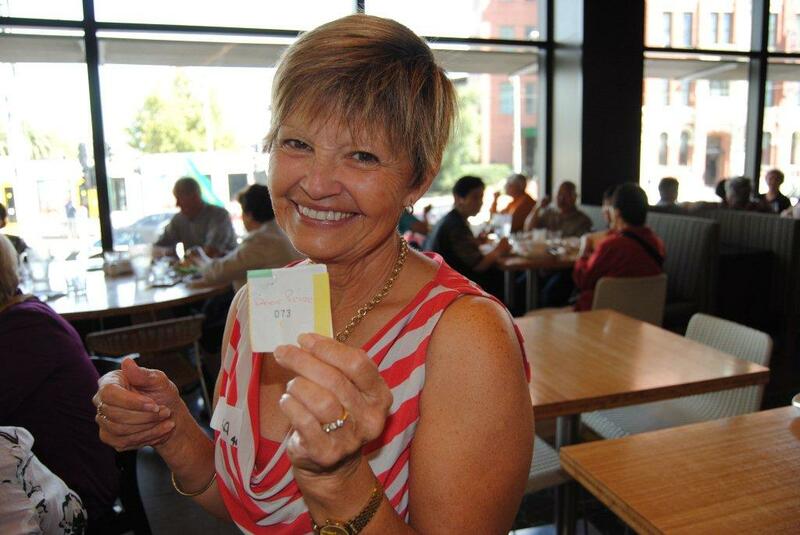 Ruth Edelsten took the photographs. 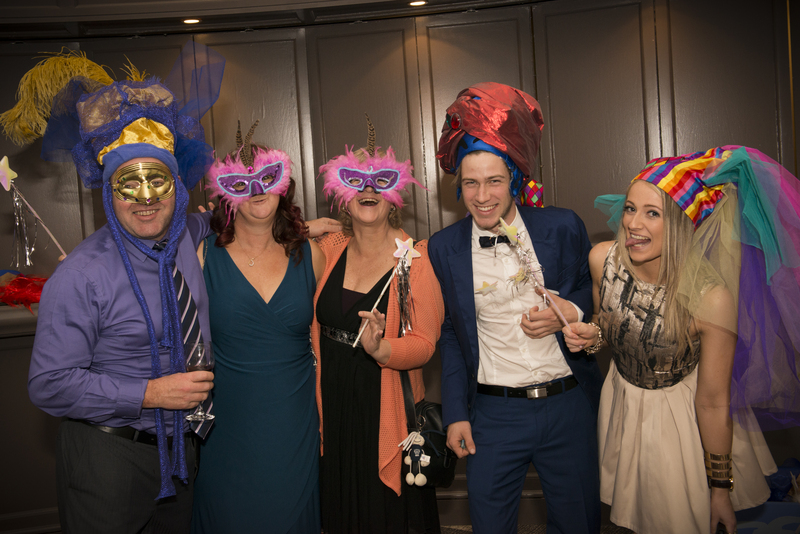 It seems to us that there can be no more enjoyable way of fund-raising for a most worthy cause – the Cancer in Kids Auxiliary of the Royal Children’s Hospital. Not only did we cover the 550 km distance in a week, we gained in fitness, saw some wonderful scenery, met many friendly and generous country people, had a lot of fun, advertised the research supported by CIKA and raised over $2000. 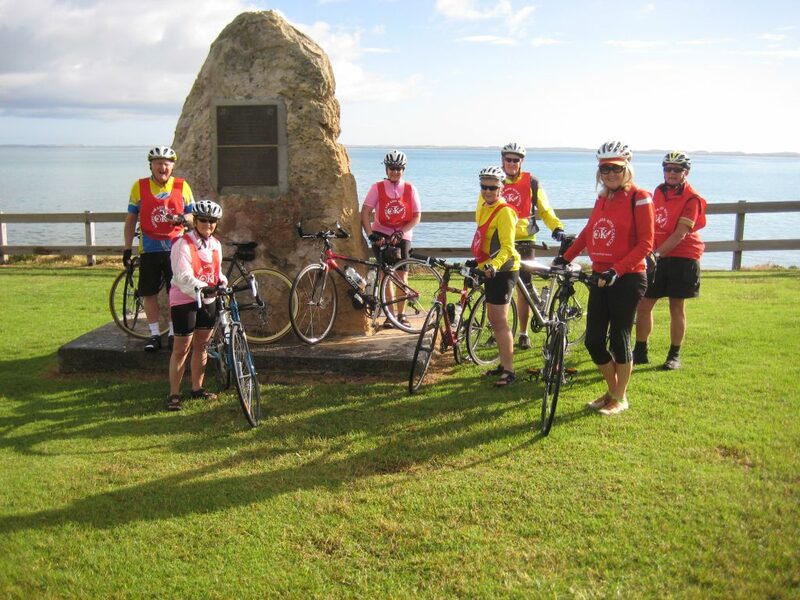 Our group of eight riders (and bus driver) aged 61 to 82 decided to follow one of the routes taken by Chinese who left their ships in Robe to walk, carrying all their belongings, to the goldfields in the 1850’s. 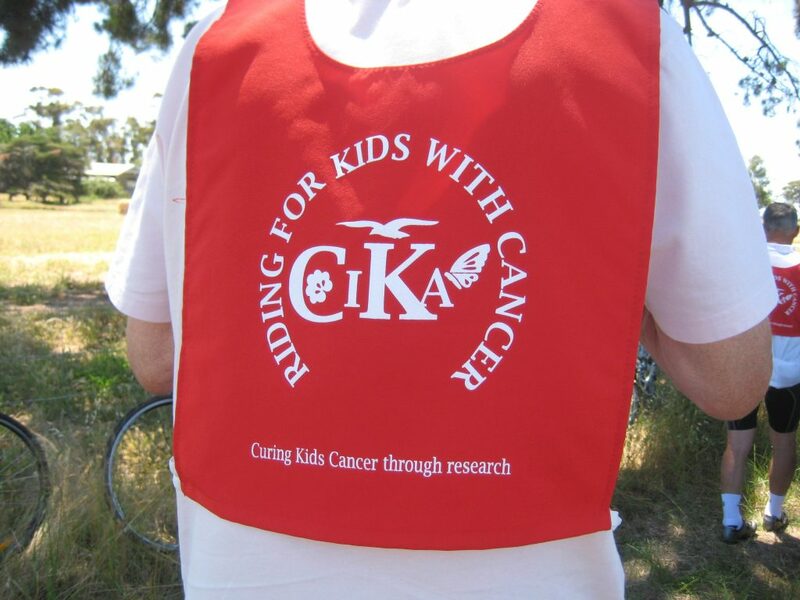 Because one of our cycling group is a member of a focus group in Gisborne which supports CIKA and another had lost a child to cancer, we readily accepted the idea of collecting donations. 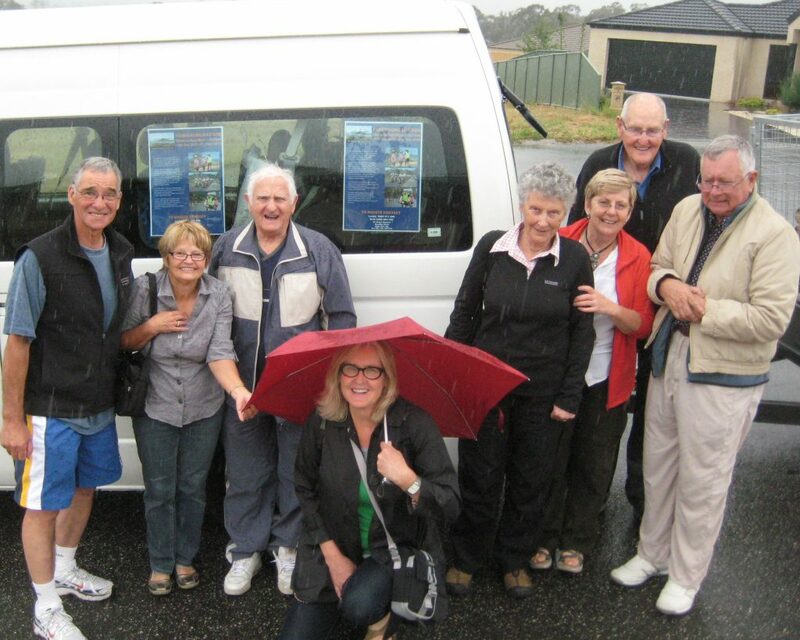 We drove across to Robe, S.A., in a small bus with bike-trailer attached, arriving on Sunday November 14th in time to be taken by Shirley (Women in Black) on a conducted tour of Robe which is a lovely historic town nestling beside beautiful Guichen Bay. 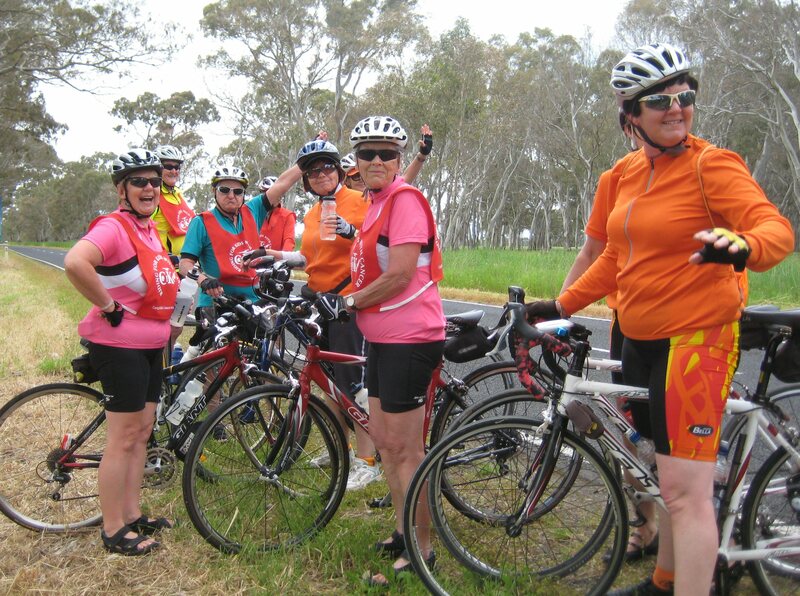 Our first day’s ride (104 km) took us along mostly quiet and flat roads to Penola where the local Women on Wheels (WOW) group met us and provided several bottles of beautiful wine donated by a local vineyard, as well as spending time with us – and riding out with us next day as far as our morning tea break. 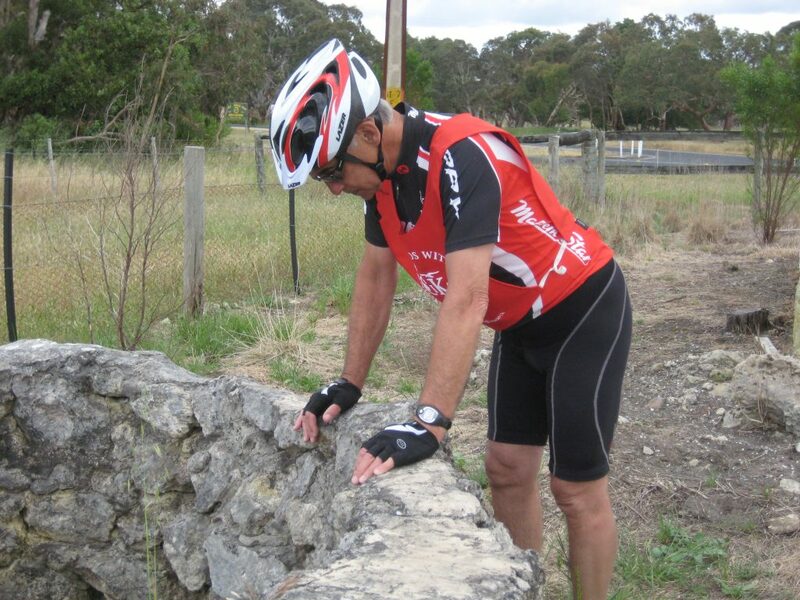 On Tuesday we encountered a few gentle hills but the shorter distance (58km) meant a really enjoyable ride to Casterton. The countryside throughout our ride at present looks a picture with lush vegetation, dams full and the crops, sheep and cattle appearing to be in prime condition. We were constantly reminded that we are fortunate to live in such a great country. But also were in awe of the Chinese whose path we were following. Day three was especially memorable as we continued on through Coleraine – stopping for Ruth to conduct another radio interview, indulging ourselves at the wonderful chocolate factory in Coleraine, then riding on to the delightful town of Cavendish (66 km). 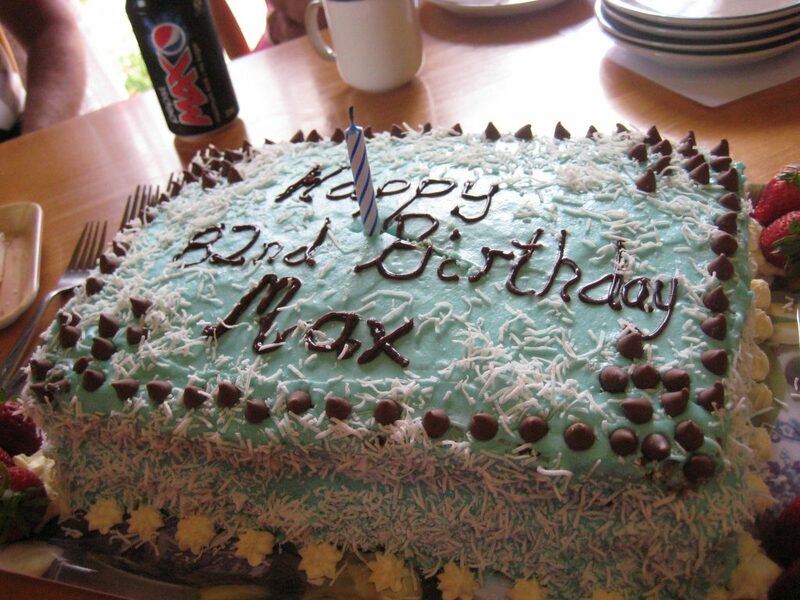 Max celebrated his birthday – 82 years young – with the help of our fantastic new friends and hosts. 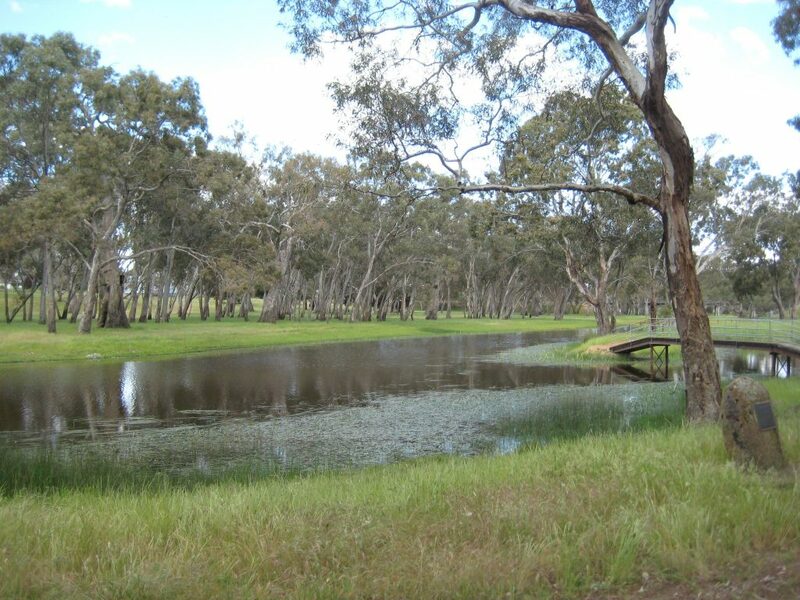 We were billeted by three families as there is no permanent accommodation, however we were taken on a tour of this beautiful town, which included the very attractive camping and caravan park beside the river. Alan Brumley, one of the energetic townsfolk had arranged our visit with great enthusiasm and care. Dinner with our lovely hosts was in the town’s hotel. This old hotel was to close its doors so fifteen families bought it, renovated it and now run it themselves. It really is very well-worth visiting and the views from the dining room over the river valley are great. 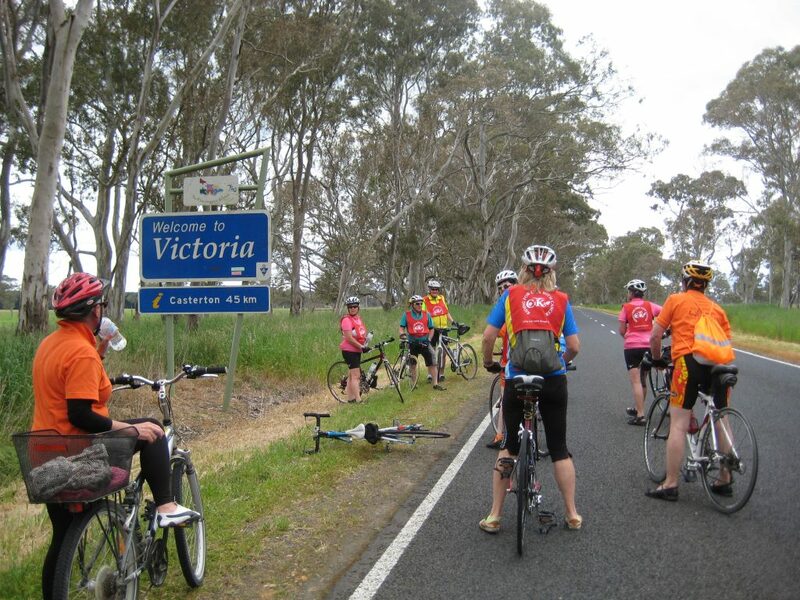 A photographer/reporter from the Weekly Times spent quite some time with us in Cavenish and, as we had notified all TV and radio stations as well as newspapers along the route, we had similar attention in Avoca, Maryborough and Bendigo. 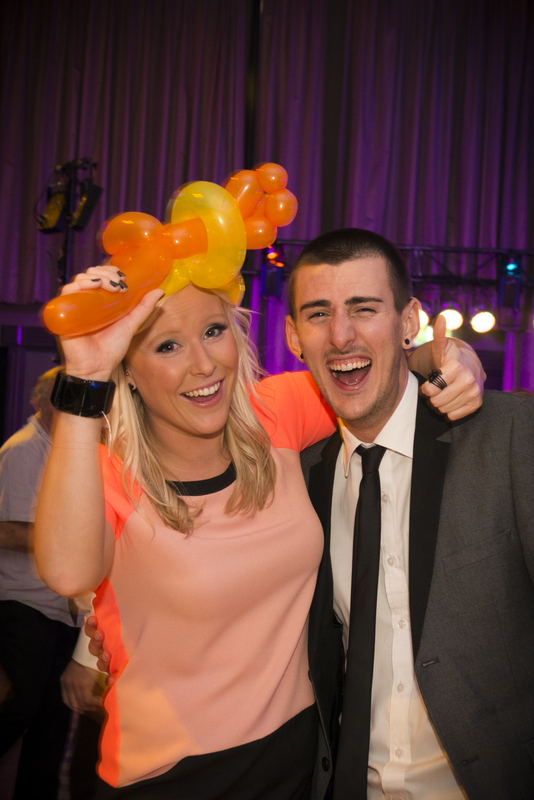 We were really pleased to be able to publicise the CIKA cause. 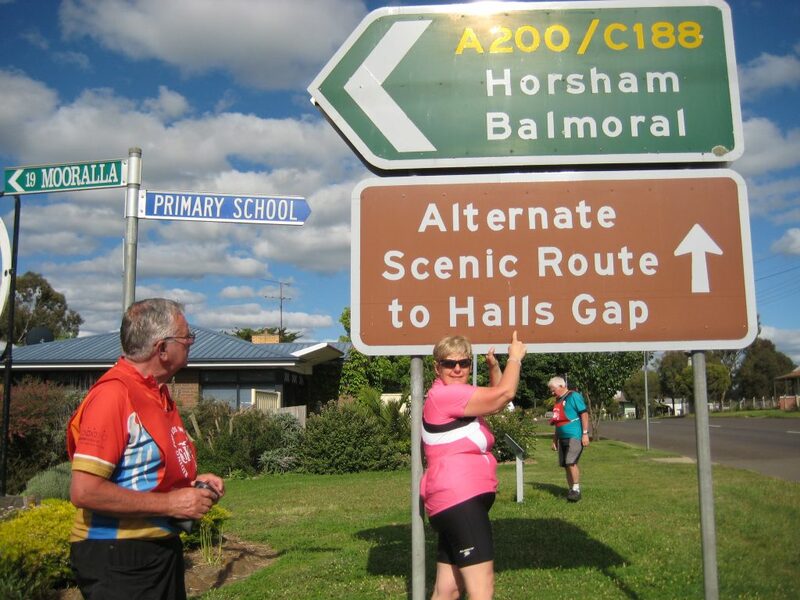 A demanding ride of about 80 km over quite hilly terrain took us through the lovely Grampians to Hall’s Gap. Then on Friday across to Ararat (82km) where we visited the excellent Chinese museum (Gum San Heritage Centre). Saturday’s weather became warmer and we were pleased to have only a 60km to ride as the hills were a little more of a challenge. Our motel hosts had gone to much trouble to make sure the locals knew we were coming and several came over to have a chat as well as to donate to the cause. In fact, in every town our accommodation was excellent and the hosts very welcoming, most went to much trouble to let locals know of the visit as well as make donations themselves. We completed the ride with a short detour to Maryborough for coffee at the historic Railway Station and on to Bendigo by early afternoon. Win TV filmed our arrival at the park beside the lake where family members had gathered to welcome our return.